that will allow the drilled hole of the shorter drill support the flute of the longer drill. practical. Drill supports, chip box, etc., are also unnecessary. max. 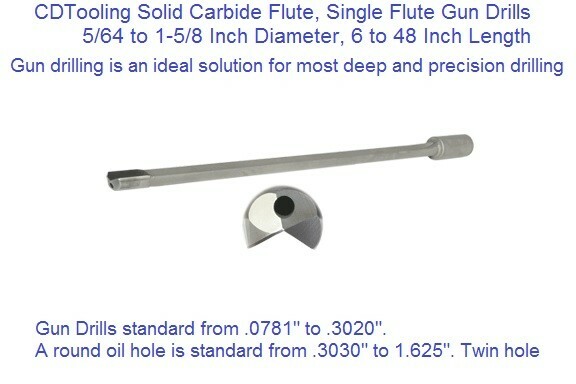 ), -0 x ½ to 1 diameter deep. The shape at the bottom of a pilot hole is of no consequence. synthetic coolant as these provide no lubricating action. We offer our DM2000 / DM3000 Spraymist Kits as an alternative to high pressure coolant. Enter the drill tip into the bushing or pilot hole dead spindle to just off the bottom. Start the oil, coolant, or mist from our Spraymist System. Drilling is continuous to depth. At depth, if a blind hole back off the bottom slightly, stop everything and remove the drill. NEVER rotate a gun drill outside of the hole. depend on material type, hardness, correct coolant type, pressure, and speed & feed.